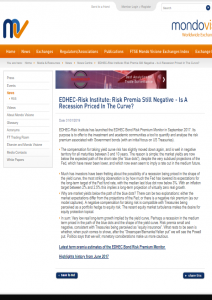 "[...] EDHEC-Risk Institute has launched the EDHEC Bond Risk Premium Monitor in September 2017. Its purpose is to offer to the investment and academic communities a tool to quantify and analyse the risk premium associated with Government bonds (with an initial focus on US Treasuries). [...]"